Amazon.com description: Product Description: From the New York Times bestselling author Robert D. Kaplan, named one of the worldâs Top 100 Global Thinkers by Foreign Policy magazine, comes a riveting journey through one of Europeâs frontier countriesâand a potent examination of the forces that will determine Europeâs fate in the postmodern age. Robert Kaplan first visited Romania in the 1970s, when he was a young journalist and the country was a bleak Communist backwater. It was one of the darkest corners of Europe, but few Westerners were paying attention. What ensued was a lifelong obsession with a critical, often overlooked countryâa country that, today, is key to understanding the current threat that Russia poses to Europe. In Europeâs Shadow is a vivid blend of memoir, travelogue, journalism, and history, a masterly work thirty years in the makingâthe story of a journalist coming of age, and a country struggling to do the same. Through the lens of one country, Kaplan examines larger questions of geography, imperialism, the role of fate in international relations, the Cold War, the Holocaust, and more. 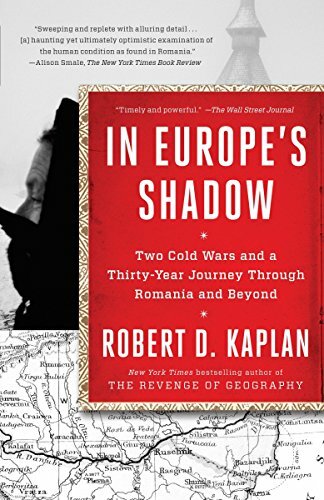 Here Kaplan illuminates the fusion of the Latin West and the Greek East that created Romania, the country that gave rise to Ion Antonescu, Hitlerâs chief foreign accomplice during World War II, and the country that was home to the most brutal strain of Communism under Nicolae CeauÈescu. Romania past and present are rendered in cinematic prose: the ashen faces of citizens waiting in bread lines in Cold Warâera Bucharest; the BÄrÄgan Steppe, laid bare by centuries of foreign invasion; the grim labor camps of the Black Sea Canal; the majestic Gothic church spires of Transylvania and MaramureÅ. Kaplan finds himself in dialogue with the great thinkers of the past, and with the Romanians of today, the philosophers, priests, and politiciansâthose who struggle to keep the flame of humanism alive in the era of a resurgent Russia. Upon his return to Romania in 2013 and 2014, Kaplan found the country transformed yet againânow a travelerâs destination shaped by Western tastes, yet still emerging from the long shadows of Hitler and Stalin. In Europeâs Shadow is the story of an ideological and geographic frontierâand the book you must read in order to truly understand the crisis Europe faces, from Russia and from within. About: From the New York Times bestselling author Robert D.
About: Robert Kaplan first visited Romania in the 1970s, when he was a young journalist and Romania was a Communist backwater where "history had virtually stopped" since World War II.